Compoundee is an easy to use financial calculator that solves compound interest and time value of money (tvom) equations from a savings and investment perspective. It can calculate how much investment will be worth over a period of time, or the necessary rate, duration of time, periodic deposits or initial investment required to achieve a desired accumulation. Compoundee makes complex calculations easy with a simple user interface that can be used by anyone, with or without previous exposure to financial calculations. Solve for any of *five* different investment variables. Compound daily, weekly, quarterly, semi-annually, or annually. Periodic deposits or withdrawals with frequency independent of compounding period. Inflation and tax adjusted amounts. Account for extra annual deposits. 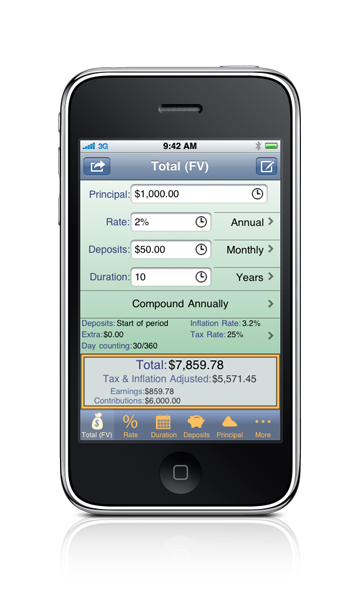 Amortization schedule by swiping or tapping. Email beautifully formatted results (including but not limited to amortization schedule). Specify deposits at beginning or end of deposit period. Maintain history of most recent entries for each input field. Specify investment lifetime in days, weeks, months, quarters, or years. Two day-counting options to allow for different types of investments. Relaunch from exactly the point where you left off. Allows use of commas and currency symbols in inputs and corrects for formatting errors. Offline user guide built into the app. No need to be connected to read the manual.